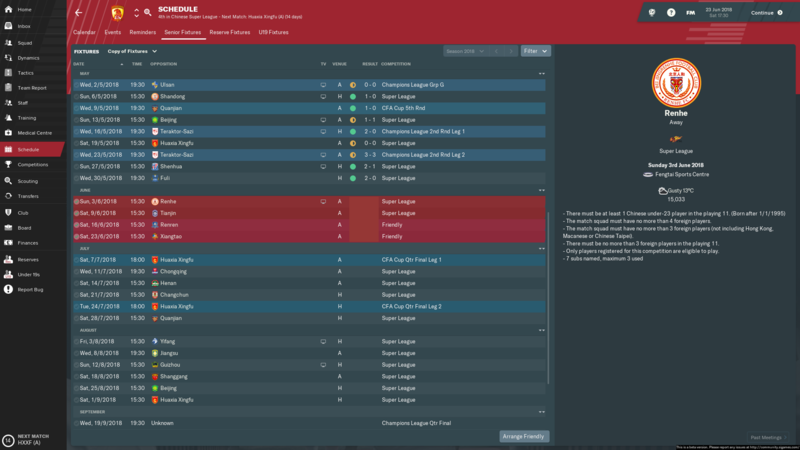 FM19 - I plan to visit many different countries in Football Manager 2019, namely in my future Journeyman posts. However, I also want to experience things at the top of a country's football pyramid, rather than at the bottom. First stop? China! I'll probably be doing a Journeyman when the full game comes out, which I've done in the past [see: Journeyman's Journey I]. I always enjoy those saves the most, constantly learning what the world has to offer at the basement level. 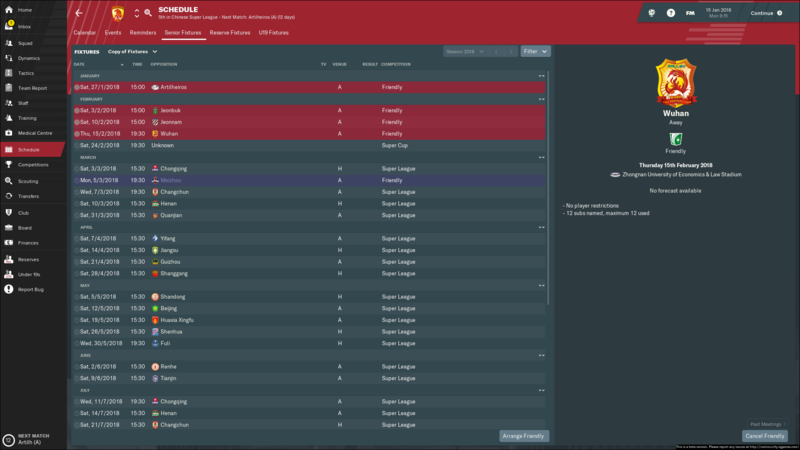 However, this year I kinda wanted to branch out to other leagues as well as doing a Journeyman. 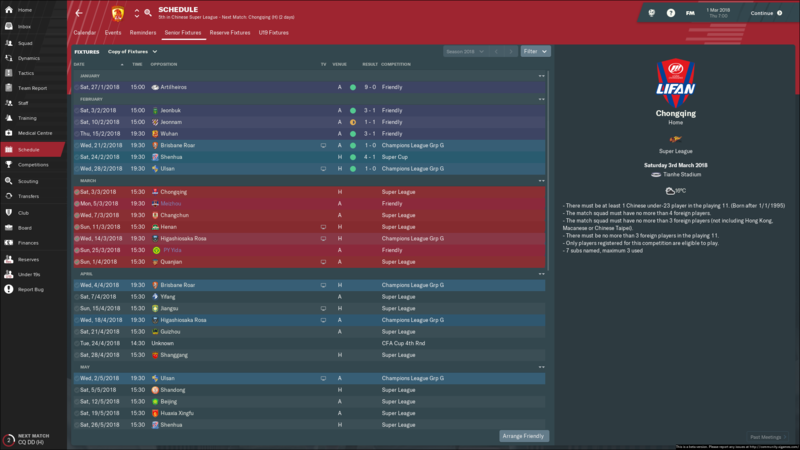 I want to experience FM life at the better clubs in any given country, see how it changes the game itself. So, I'll be doing somewhat tour-like saves of many different nations. 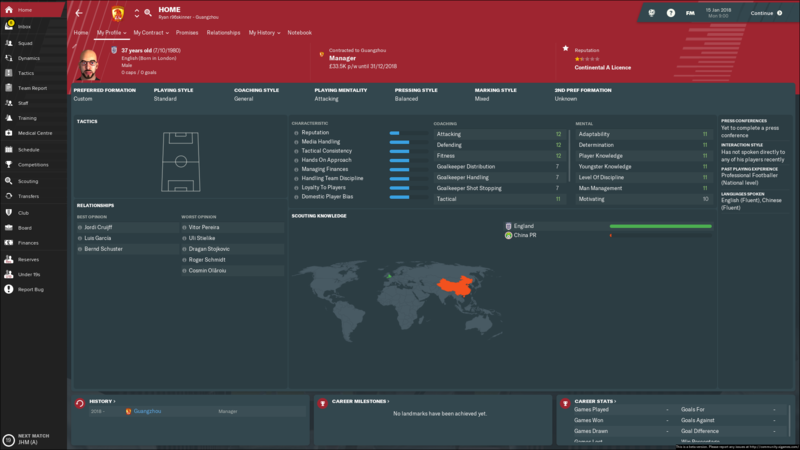 First up, I decided I wanted to begin in Asia, China to be specific. 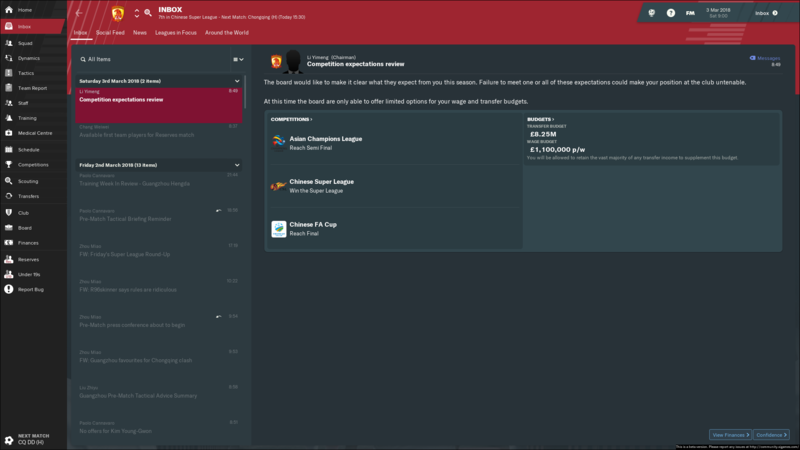 I've managed extensively in Asia and China in the past, but never for any of the big clubs - so, given these saves that are coming, I thought why not begin with China's biggest club - Guangzhou Evergrande! I've set all the usual game settings, no in-game editor etc. 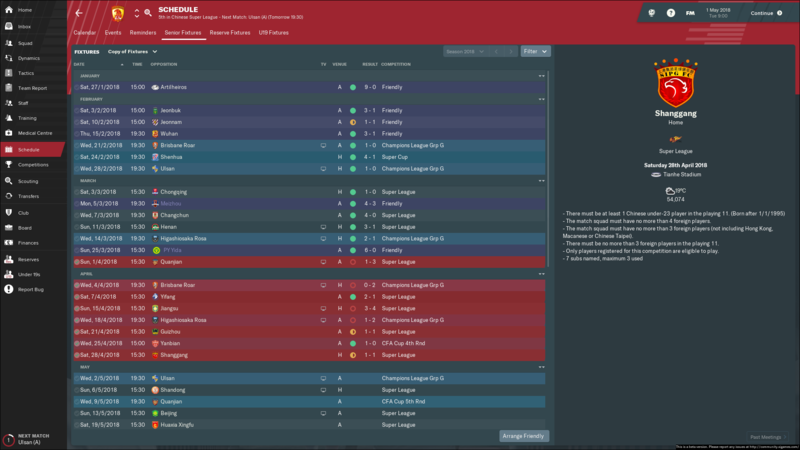 Manager stats are 'based on Guangzhou Evergrande', usually I'd give myself the bottom presets but as it's a new game I wanted to give myself a chance. 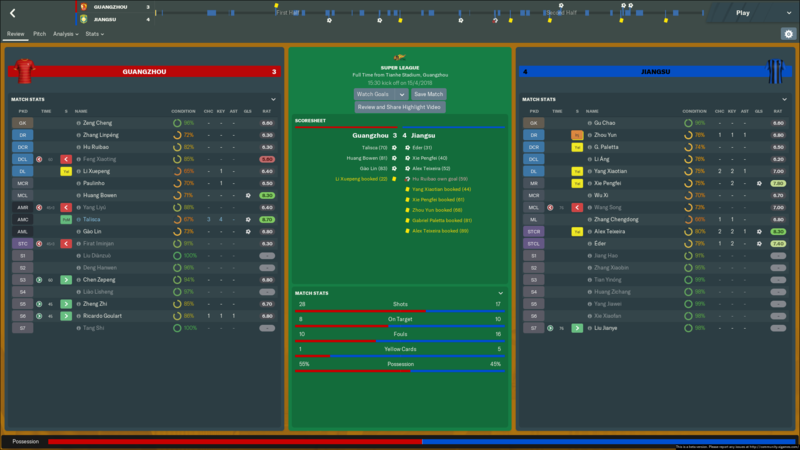 Don't expect much though, I'm not amazing at FM - I just enjoy (for the most part!) playing it. Good luck with this, i'll be on board as always! Good to see you're back @r96Skinner and I'll be following as per usual. 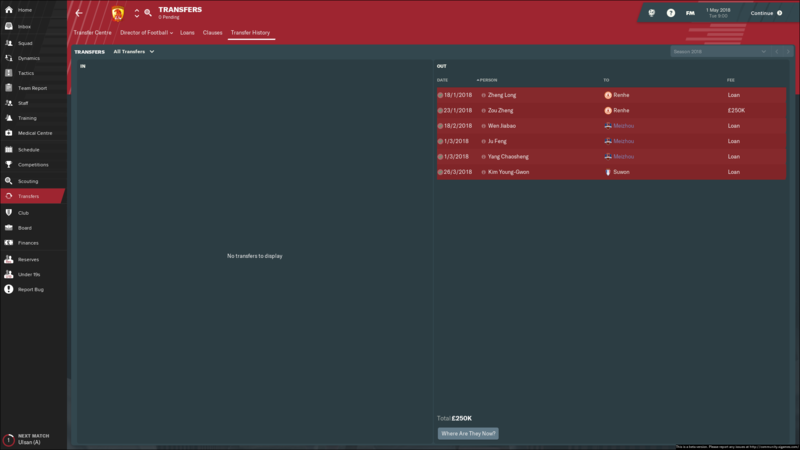 Loved your journeymans journey thread, I've also managed a lot in Asia and on my last save on 17 I got interviewed, and turned down for the Evergrande job 5 times so I have a grudge against them haha but good luck. Nice of you to say, cheers! Haha, nice. I do find Asia a fun place to manage, especially as FM has a nice set of leagues. Likes of Indonesia/Hong Kong at the bottom, before making your way up to hopefully reach China/South Korea. 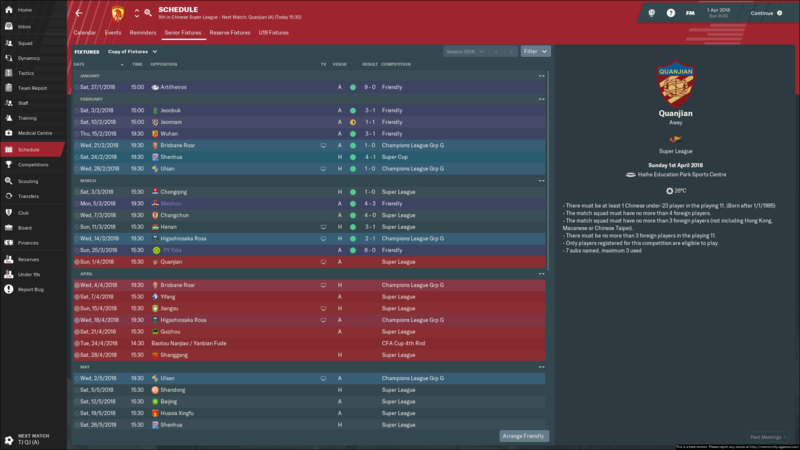 Yeah totally agree, Asia is my go to place on long saves to build up a bit of rep, I always seem to spend a lot of time in Malaysia and I have a lot of love for Perlis and Kedah from Malaysia. 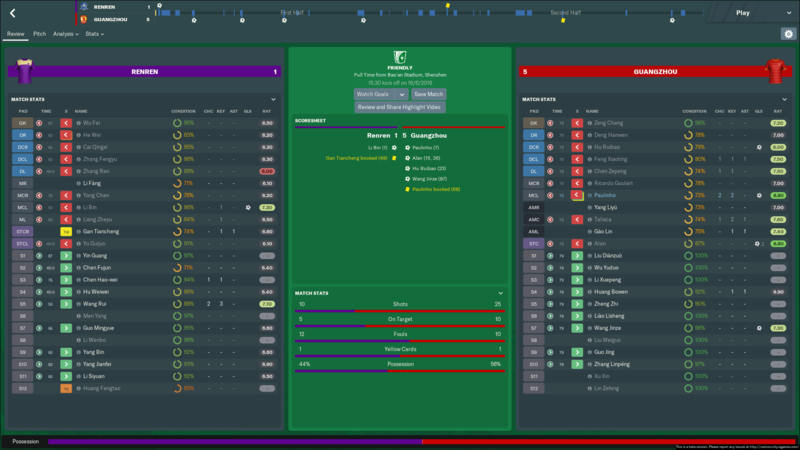 I remember getting the Gangwon job in South Korea and turning them into a title contenders, only for them to knock me out of the Asia Champions League a couple of seasons later when I was at Perth Glory, good times man! Looking forward to your updates. That must've been tough to take, love those type of scenarios though. Malaysia is a good one, I had a pretty amazing save there a few years ago with PKNS. 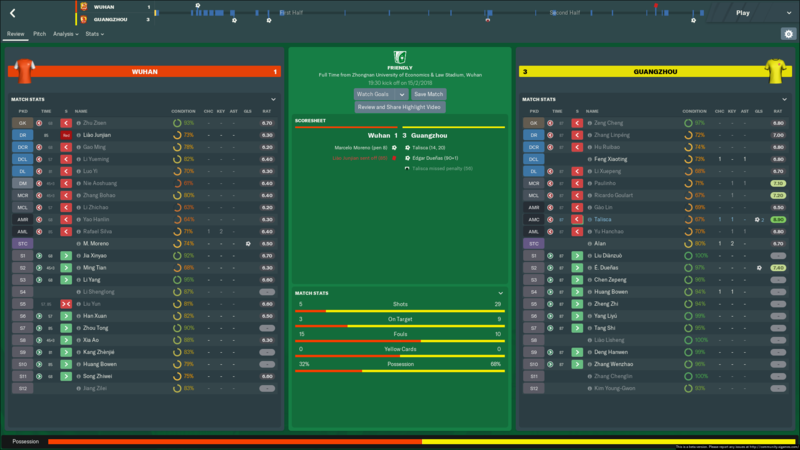 Got them promoted from the Premier League, won 20/22 games; winning all the first seventeen league matches. 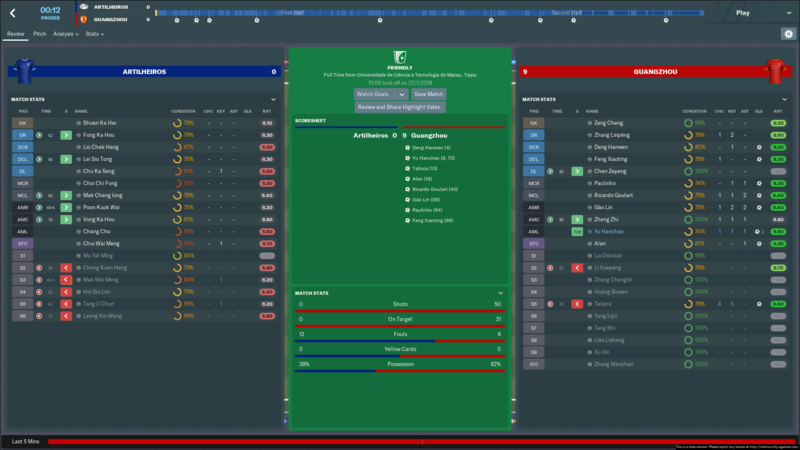 Also won on the FA Cup in the same season, probably the most successful I've been at one club; which says more about my ability than anything else! I plan to follow your Journeyman btw, just need to find the time to begin reading! 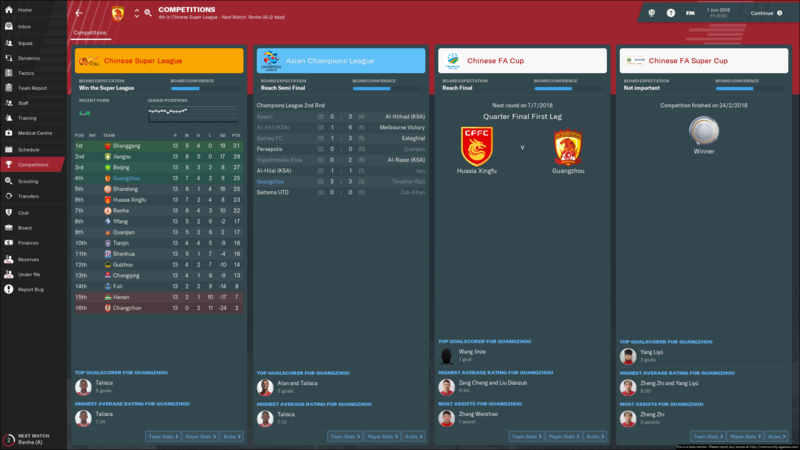 Four exhibition friendlies coming up, with a trip to Hubei to meet Wuhan Zall ending our pre-season preperations ahead of our AFC Champions League campaign starting as well as the Chinese Super Cup showpiece towards the end of February. Before I share the results, a few things to tell. 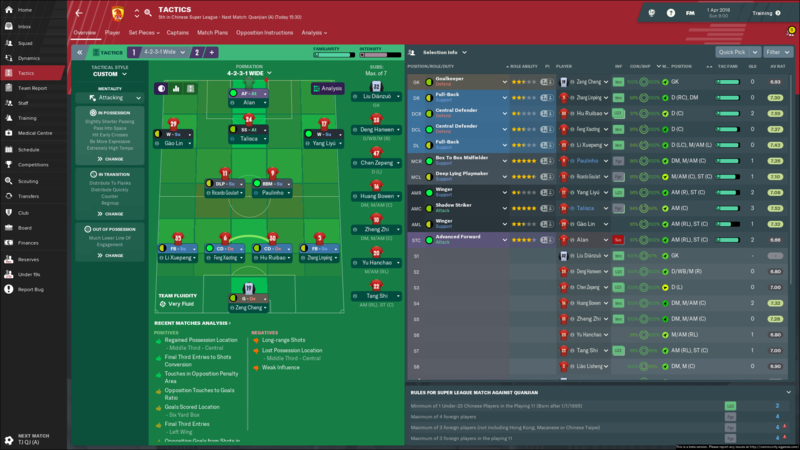 A: I've replaced Fabio Cannavaro as manager, but his brother Paolo remains as my assistant manager - probably not the smartest move! 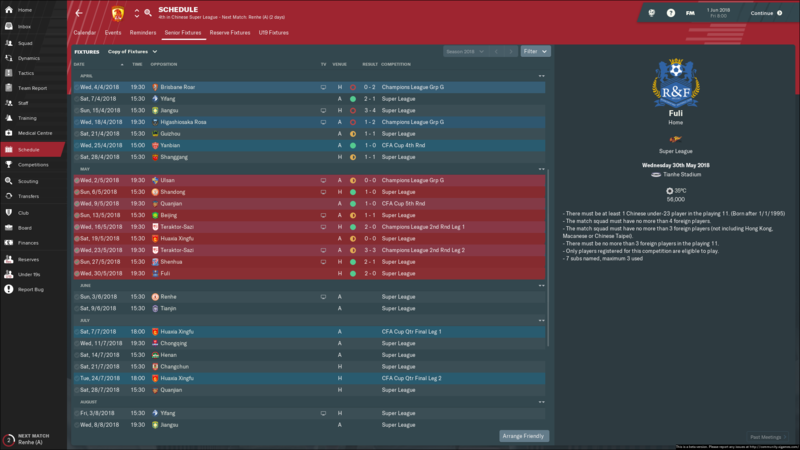 B: Here's the squad I have to work with, with the foreign players highlighted. On that point, the Chinese Super League only allows four foreigners (five if one is Asian). C: Lastly, here's my manager profile. 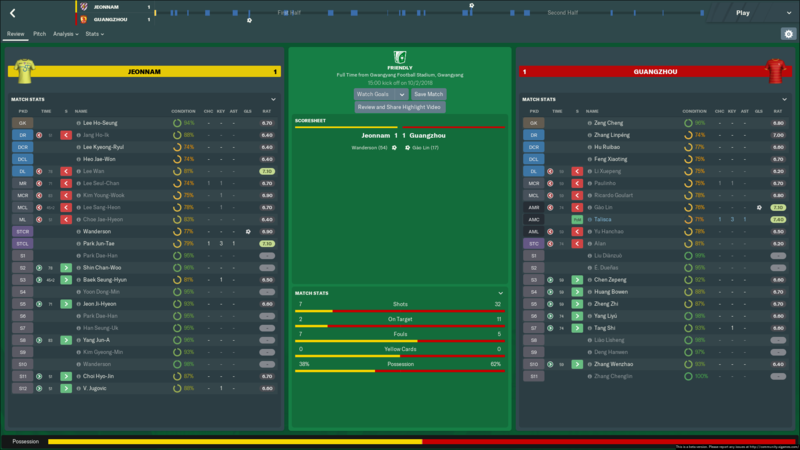 Overall, I'd say that was a good pre-season period. Dominant win over the Macanese club in game one as you'd expect, but we had much tougher tests in our South Korea double-header. 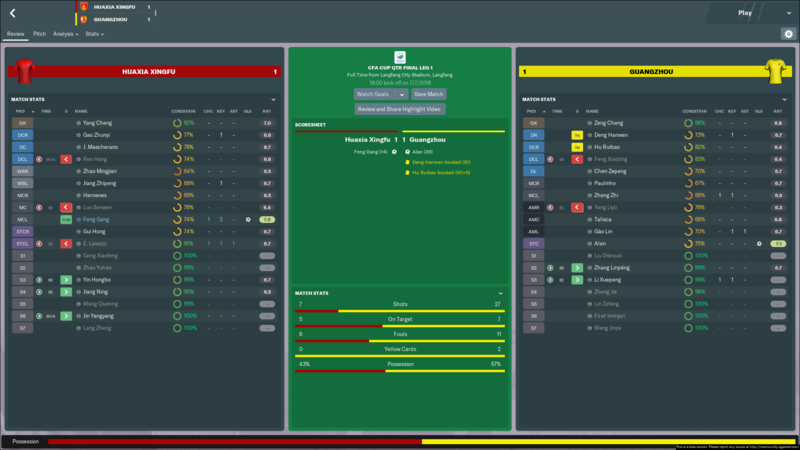 Terrific win over Jeonbuk, probably South Korea's best. 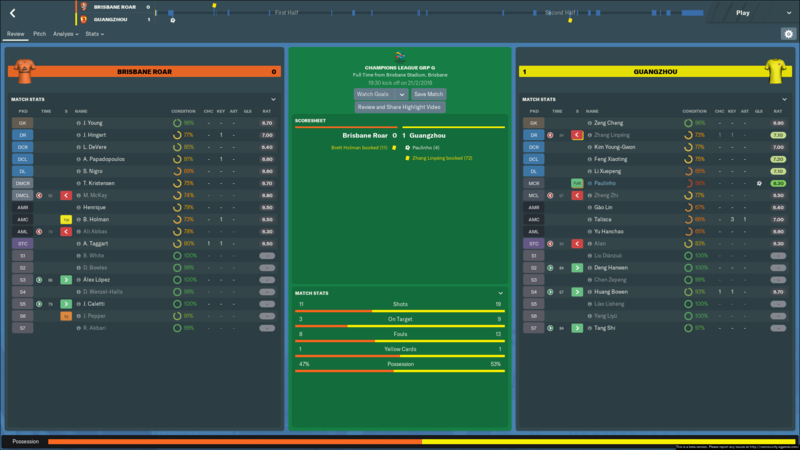 We were held by Jeonnam, but made up for it with a win back on home turf over Wuhan Zall. Buzzing for the start of the competitive season! As you can see above in the schedule, our AFC Champions League group has been drawn. We face trips to Australia, Japan and South Korea. We're probably favourites to finish top, Ulsan Hyundai may be our toughest opponent - though Brisbane Roar and particularly Kawasaki Frontale* will likely give strong tests. *known as Higashiosaka Rosa in-game, due to licence issues. I didn't think it would be smart to do the name fix thing on the beta, seems an iffy thing to do to the save files; maybe not, but didn't want to risk it. I'll certainly be doing it when the full game is released, so in my Journeyman it'll be done! Yeah by the last rejection I just gave up. I'll read your PKNS thread man! Thanks for following mine, should have an update tonight or in the morning. First off, where did you make that dope header bro?? Funny that Poalo Cannavaro stuck around, is he worth keeping on? 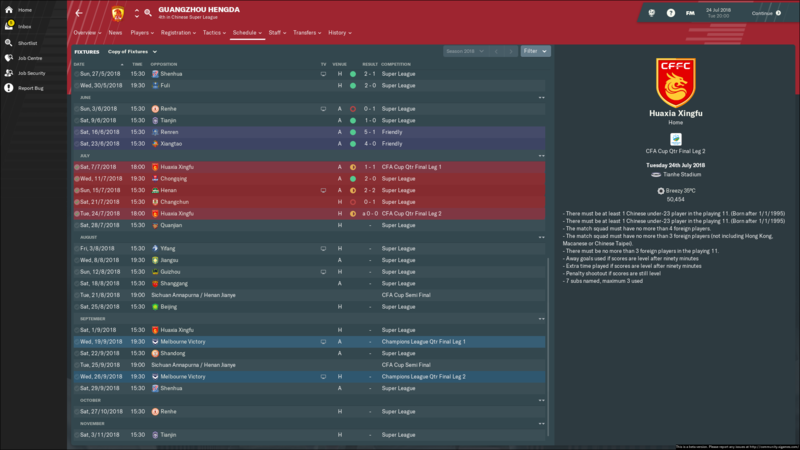 The Asia Champs league is weird, it seems to run through 2 seasons especially in Malaysia when the league ends in November you have to wait until February for the next set of games. China super league ends half way through the champs league too, hopefully won't have much of an impact on you though. I made it in Microsoft PowerPoint, with free fonts from 1001fonts. Happy with how it turned out! Not actually thought about that with the ACL, shouldn't be too much of a problem - if I can get them that far, of course. Hmm I may give it a go in pwoer point, I'll fail miserably however haha. I'm sure you'll get out of the groups in the Champs league, with a few good performances you should do anyway. I always see Saudi trams boss the champs league. Quite the way to begin the competitive campaign. Two key AFC Champions League group stage encounters falling either side of the Chinese Super Cup final with Shanghai Shenhua. Most may not take Super Cups seriously, but I am the opposite. A trophy is a trophy - more, the better! So in that regard it was frustrating to have all three of these games scheduled so closely together. 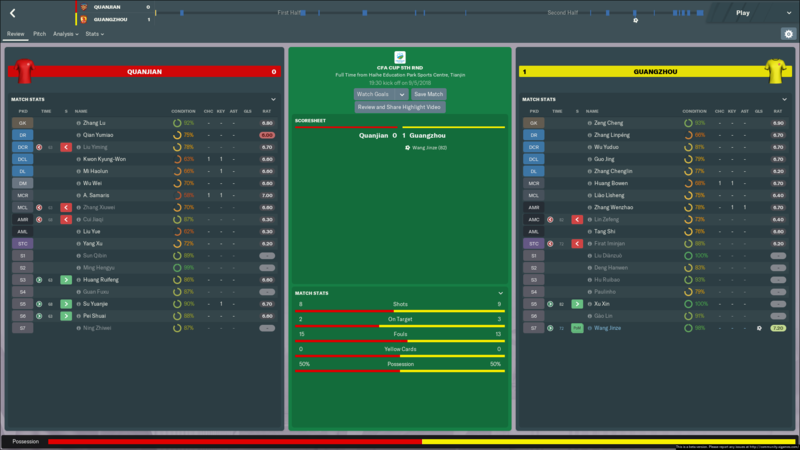 As such, I had to play a massively rotated team for the Super Cup. 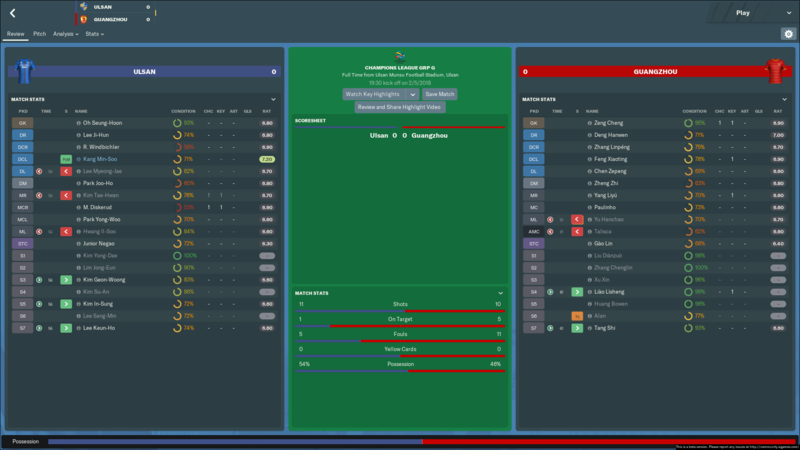 Three consecutive victories, very pleased with that. 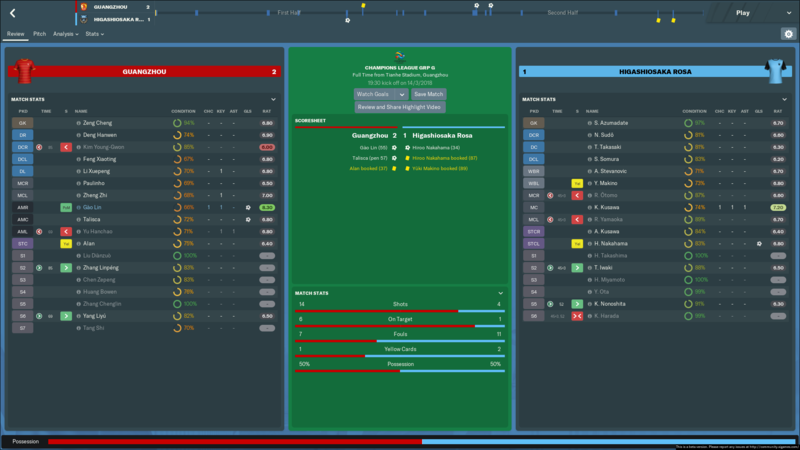 As I alluded to a moment ago, despite wanting to truly win the Super Cup I decided it was clearly best to prioritise the AFC Champions League. So I did, which paid off. 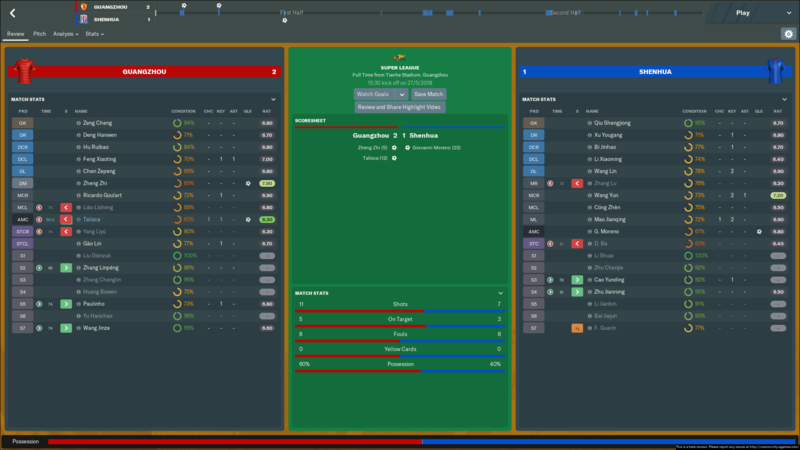 My first eleven secured narrow wins on Matchday 1 & 2 versus Brisbane Roar and Ulsan Hyundai, winning both matches with sole goals from star foreigners Paulinho (on loan from Barcelona) and Talisca (on loan from Benfica) respectively. They should be extremely key players for us this season. However, the most satisfying aspect of this opening month was the Chinese Super Cup. 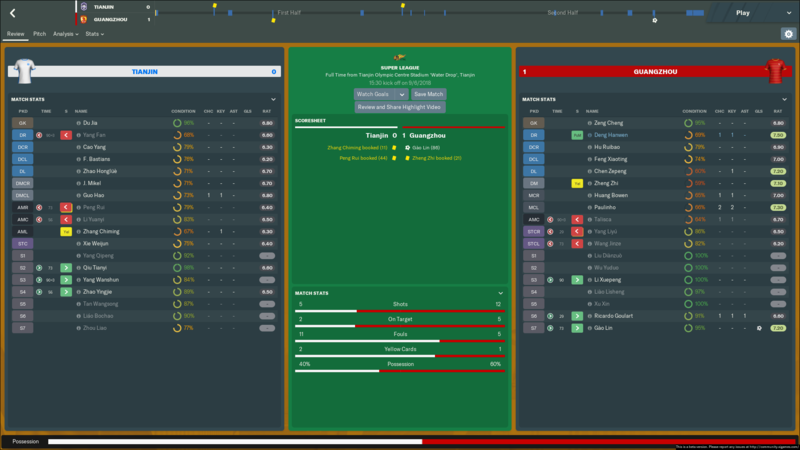 We ran out 4-1 winners, notably going 3-0 up. That's despite resting the likes of Paulinho, Talisca and Gào Lin. 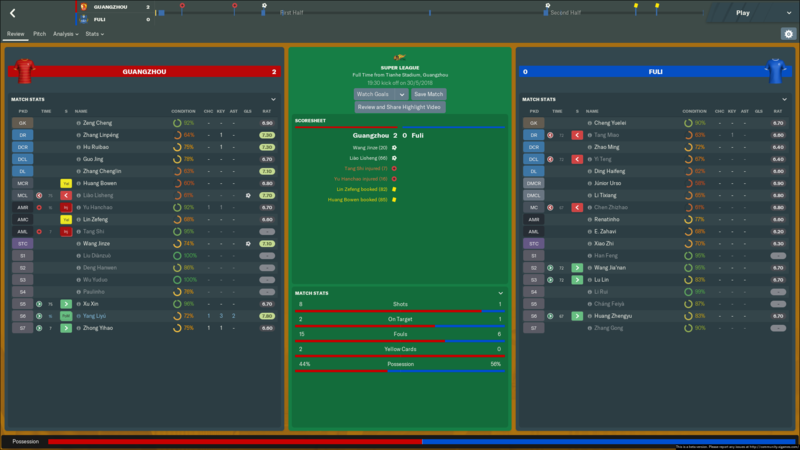 Fortunately, we had a fully fit Ricardo Goulart to choose as he isn't registered for the AFC CL - I had to lose a foreign player due to the rules, so Goulart was the one to drop out. Worked out, as he scored for 2-0. He wasn't our star man though, that honour fell to Yang Liyú - a 21-year old debutant who scored two goals. Brilliant moment for him. 3 games = 3 wins! Great start man! Get a decent run of form early on. 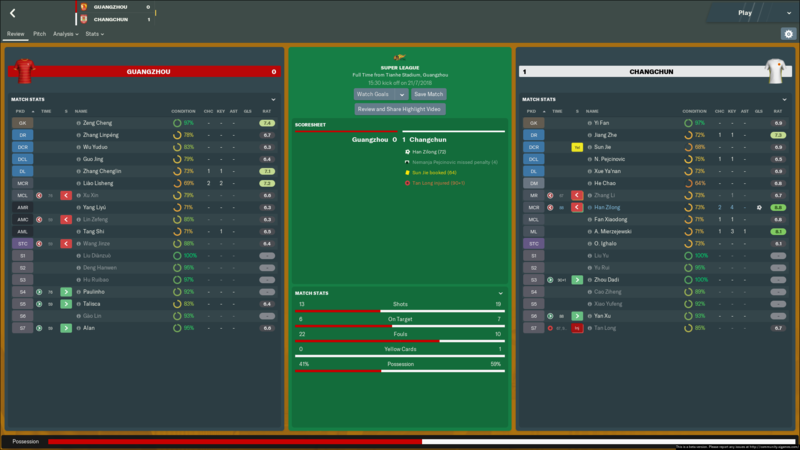 The busiest month of the season so far, March 2018 gave us three Super League matches, one Champions League game and two friendlies. 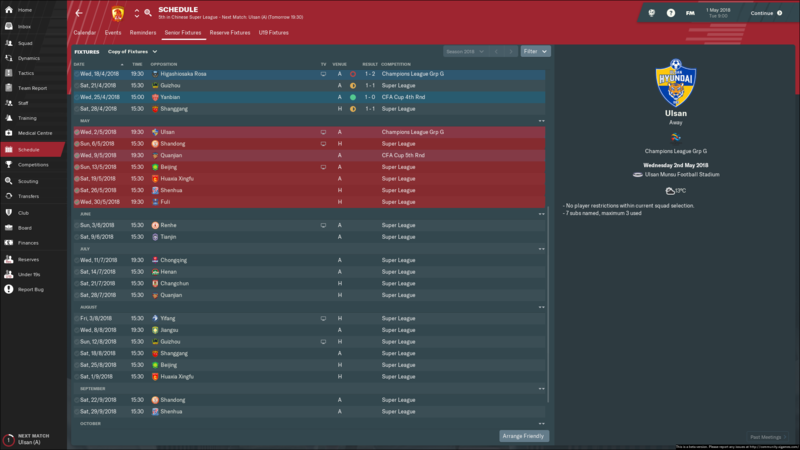 Six fixtures overall. Another month of winning, we've now won all seven competitive fixtures! We are one of the best teams in our part of the world, but I am still delighted with that run of form. Hopefully it continues! Chongqing Lifan opened our 2018 Chinese Super League campaign, left-winger Yu Hanchao giving us an opening day three points. 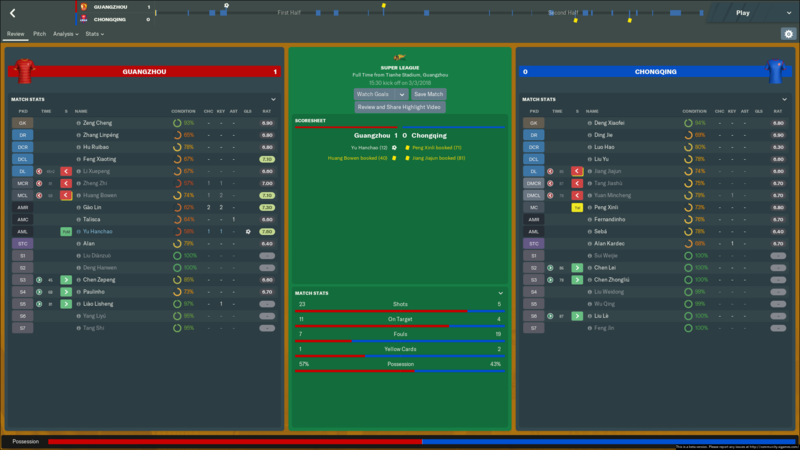 In our other two league fixtures, we put four past Changchun Yatai away from home prior to thumping Henan Jianye on Matchday 3. Friendly form been good, the Meizhou Hakka one was a thriller! That one AFC Champions League encounter was big, hosting Kawasaki Frontale on the third match date. 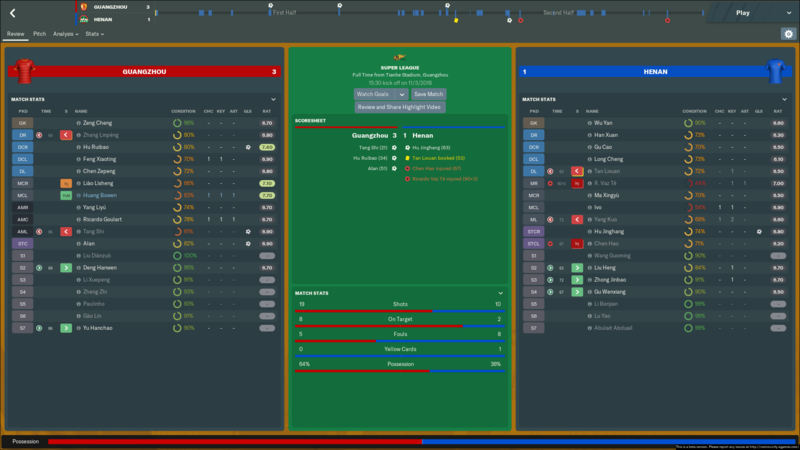 We made it three wins from three, we were much the better side but the result ended in a rather tight 2-1 victory. I'll very much take it, it leaves us (competition standings below) top of Group G, five points clear of any other team. A win next time out against Brisbane Roar will see us qualify for the knockout stages, if Kawasaki Fontale drop points vs. Ulsan Hyundai we'd be group winners with that hopeful win over the Australians. A couple of things to share before I wrap this up. A: Here are the board expectations. 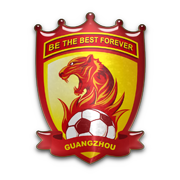 They want the CSL title as you'd expect, whilst also wanting a semi-final berth in the AFC CL and an appearance in the final of the CFA Cup. Doable, certainly. B: Our CSL opener gave me my first experience of VAR, which has occurred regularly in the league; as it's one of the world's few that currently operate VAR. All gone in my favour so far, sure that wont last! 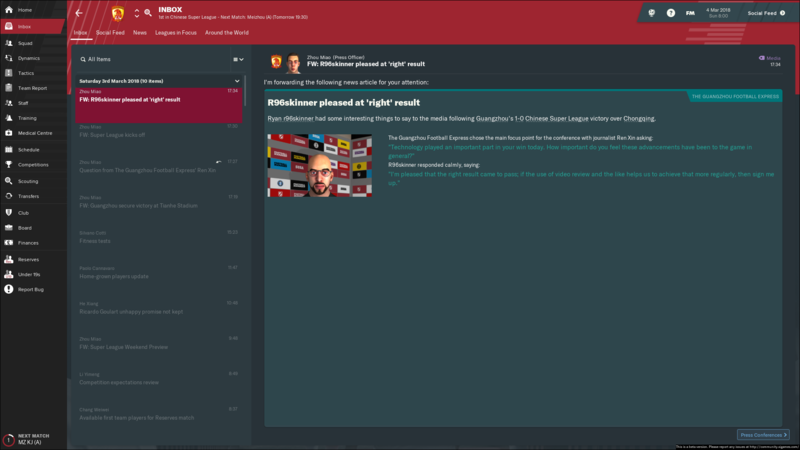 D: March ended with some personal glory, I won the period's Manager of the Month award. Always nice to get some recognition. We came into April looking to build on our run of seven straight wins that we achieved to begin the 2018 season. Eight fixtures on the way, all competitive. April was quite the struggle. Just two victories from eight matches. In all honesty, not one good performance in the lot. 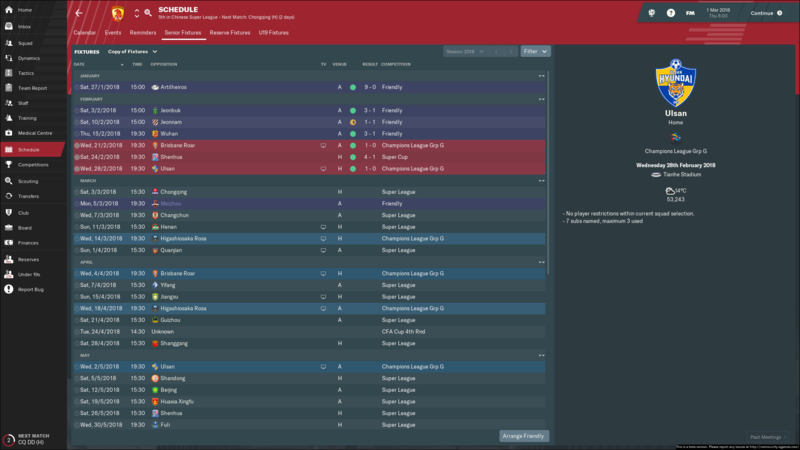 It's as if I'm managing a different team all of a sudden, a real sharp decline. 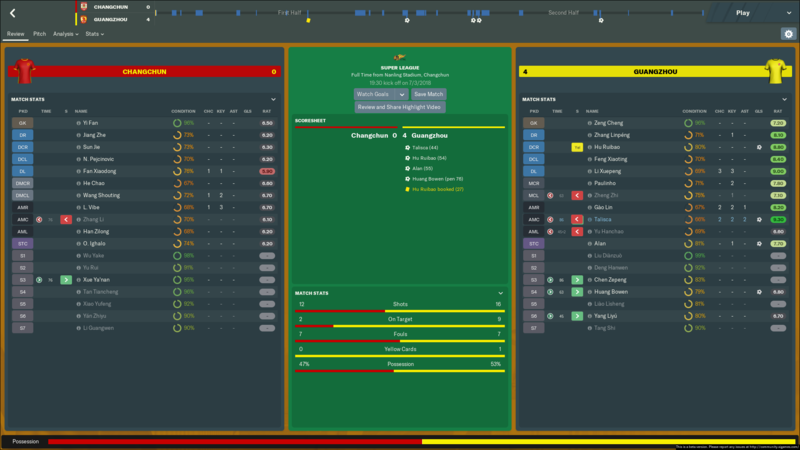 The month began in the worst possible way, we lost consecutively to mid-table Tianjin Quanjian in the league and also to Brisbane Roar in the Champions League. Both matches we near identical in terms of performance. The squad hit back with three points against Dalian Yifang, but then immediately chucked them away by losing, again back-to-back, versus Jiangsu Suning (CSL) and Kawasaki Frontale (AFC CL). 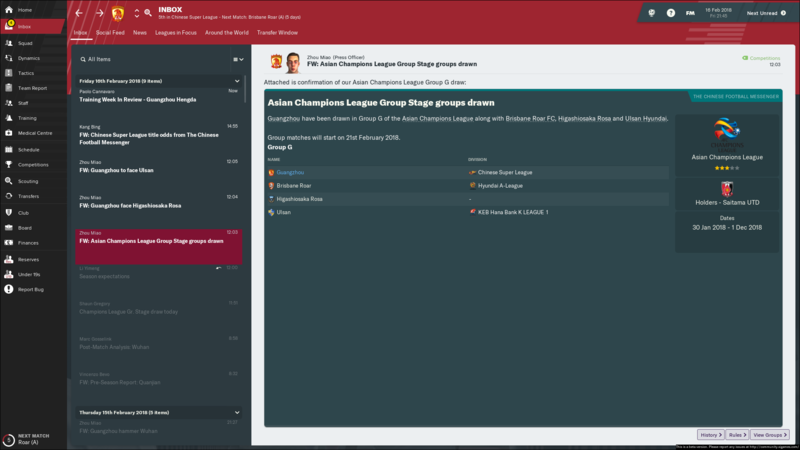 Our Group G run in the Champions League isn't looking so good. In the most recent three games, we've somewhat stopped the rot - three undefeated after two draws and a win, with the latter arriving in the CFA Cup against second tier Yanbian Funde. How times change, from how great March was to this car crash of an April. The board and players, for now, are generally fully backing me, though a few murmurs have come out recently. A massive improvement is a necessity, especially in the AFC Champions League: winless Ulsan Hyundai await for us on the final matchday, it is still all in our hands as we only need to win our fixture - no need for immediate favours from elsewhere. As for the CSL, that's still salvageable but only just - 8pts off top. Just the one extra thing to share. A: I forgot to include the transfer window recap prior to this post, probably because it was very quiet on our part. 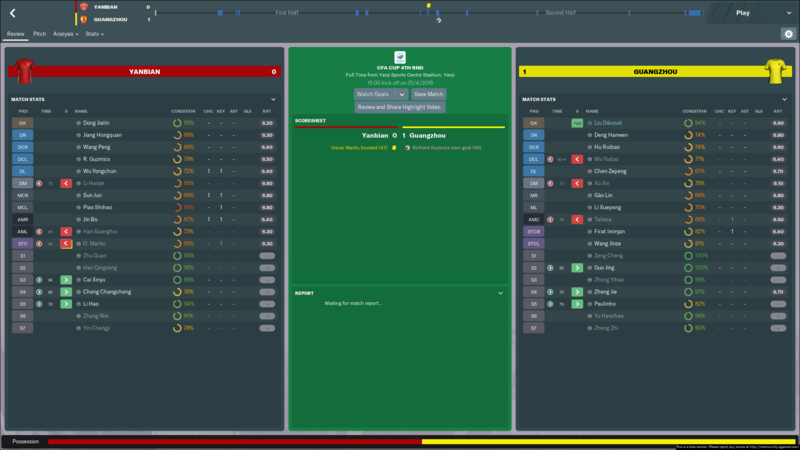 No new signings, six players did depart but none were key players; most notable would be Kim Young-Gwon, the South Korean centre-back was unhappy and wanted to leave - K League 1 side Suwon Samsung Bluewings subsequently loaned him. Did someone seriously prank your team on April Fools Day? Form seemed to take a major hit from there! Ha, no kidding! Nothing changed with the players/tactics/board at all between March and April, yet the performances have dipped massively. Good results so far mate. How far you think you can get in champions League? I always see them do well in all my saves. Not sure to be honest, quarter-finals as a minimal I'd say. 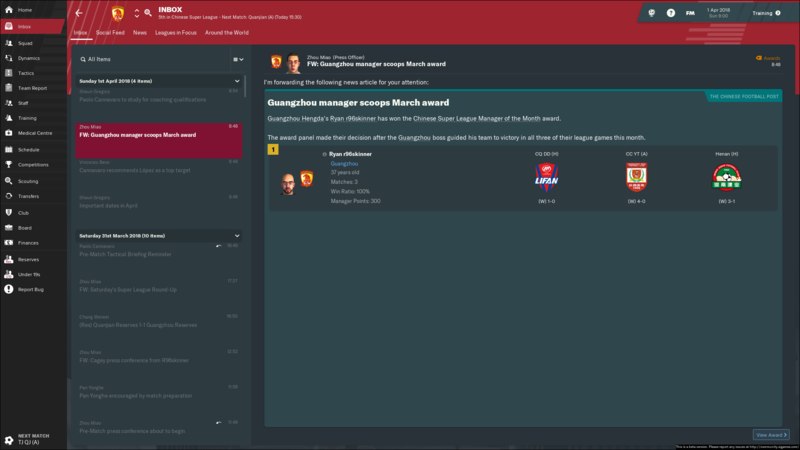 After a woeful March set of fixtures, I led Guangzhou Evergrande into April knowing a major improvement was needed. It has been yet another busy period, an initial seven games to share with you today. That's more like it! We're on the right tracks, that form must continue if it's to mean anything serious but I am very relieved given how bad April went. Nine matches in total by the end of the month, we didn't lose a match; five wins and four draws, too many of the latter for my liking but it's an improvement. 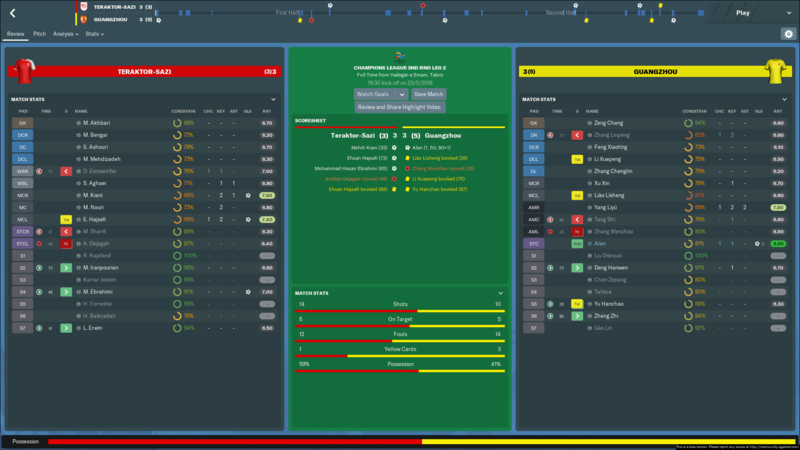 May started with a massive encounter in the AFC Champions League, we had to beat Ulsan Hyundai to give us the best chance of advancing. 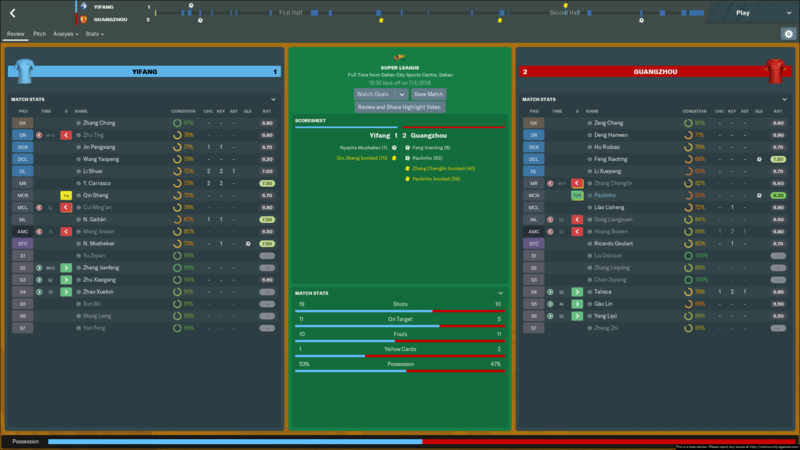 That didn't happen, as we were held by the winless South Koreans to a tie - luckily, it didn't cost us as Brisbane Roar lost to Kawasaki Frontale - so even if we lost to Ulsan, we would've qualified. After securing a knockout round place in the AFC CL, our opponents in that aforementioned round were announced - Iran's Tractor Sazi, managed by John Toshack. Before two games with them, we had three straight domestic fixtures to focus on. 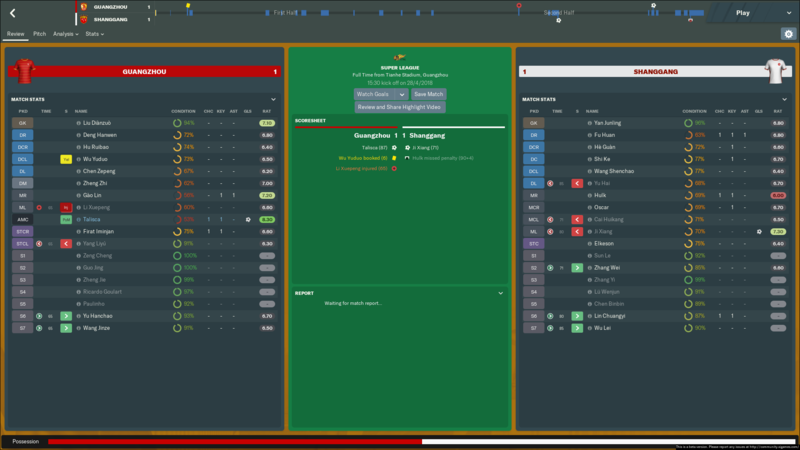 First up were first place chasing Shandong Luneng, who would've went top with a draw but didn't as Talisca grabbed us the points. Big win! 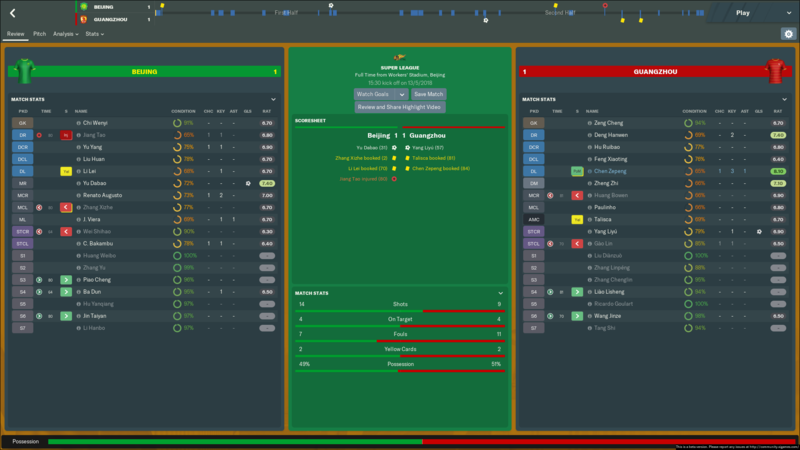 Due to fitness issues, I was forced to play a fully rotated team vs. Tianjin Quanjian in the CFA Cup fifth round, that didn't show though as a mixture of reserves/youngsters turned up and got us in the hat for the two-legged quarter-finals. Very pleasing. 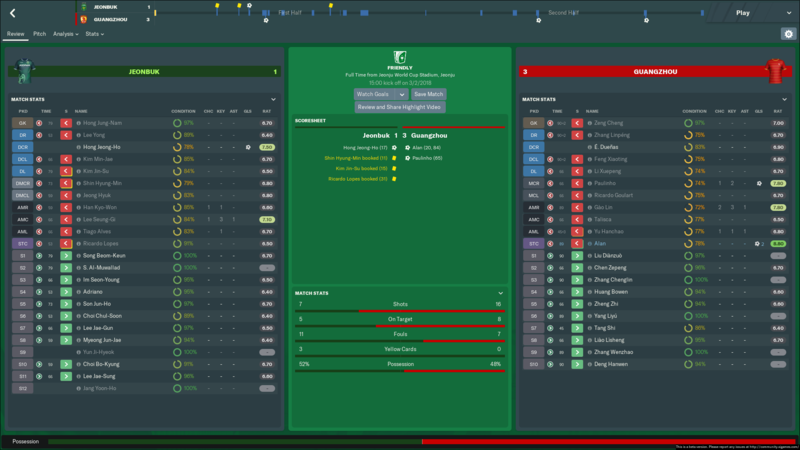 After that we faced Beijing Guoan, another title chasing team, and got a credible draw. Then came the major Champions League matches with Tractor Sazi. We aimed for a good result at home in leg one to hopefully kill the tie early, we didn't exactly do that but a 2-0 victory put us halfway through. Given that, I made a sizeable call. 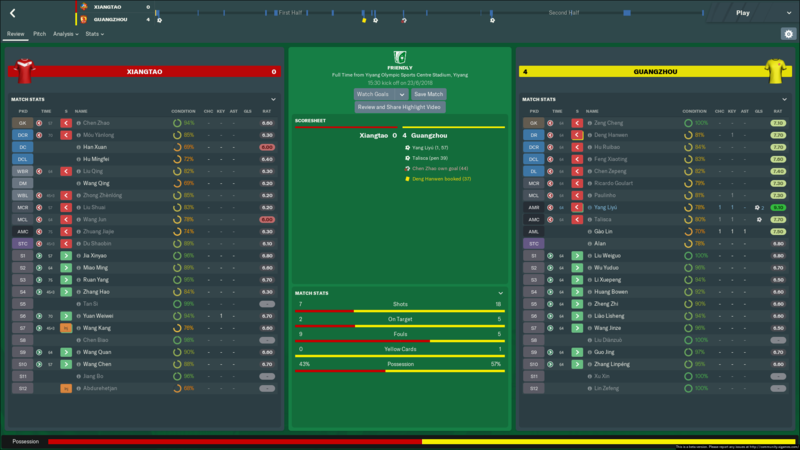 Play my full first-team days later in the league against Hebei China Fortune (which we drew), and give them a much needed rest in the second leg ahead of key Chinese Super League matches soon after. As you can see, it was a decision I just got away with. 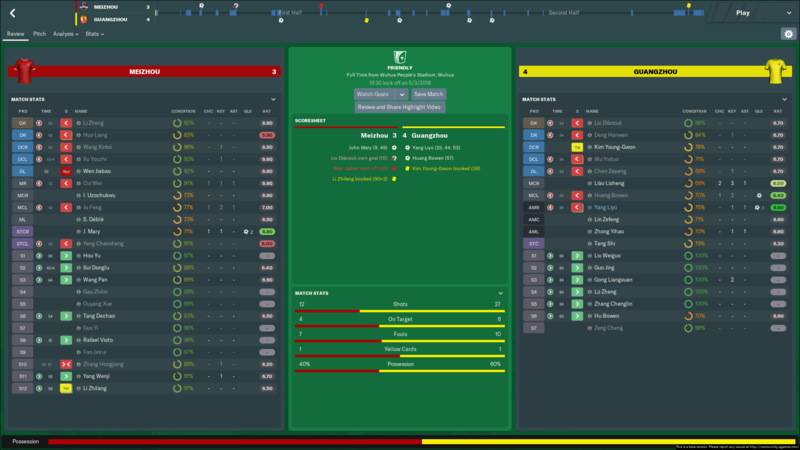 A thrilling 3-3 draw occurred in Tabriz, with Alan (who has been suspended in the league for a while - still until July - seemingly due to an incident in real life April - bit weird it carries over in-game) netting a hat-trick to send us through. May ended brilliantly, with major back-to-back CSL wins over Shanghai Shenhua and city rivals Guangzhou R&F. 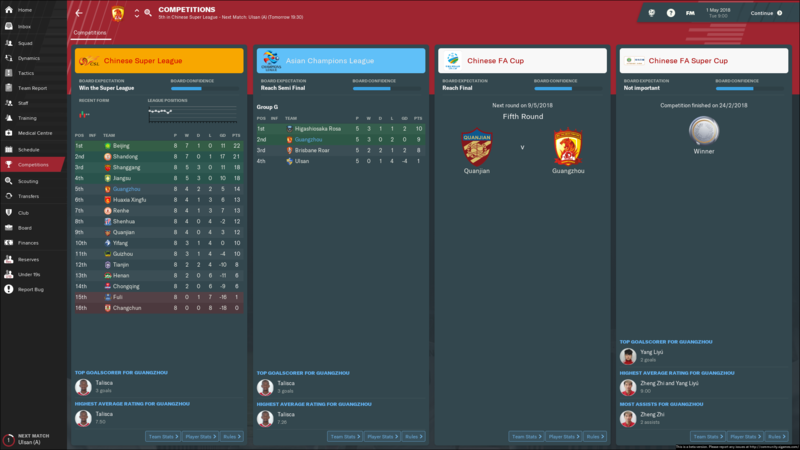 Those help move us into the top four, we sit six points off league leaders Shanghai SIPG. Our next Champions League opponents are yet to be determined, but Hebei China Fortune await in the CFA Cup quarters. 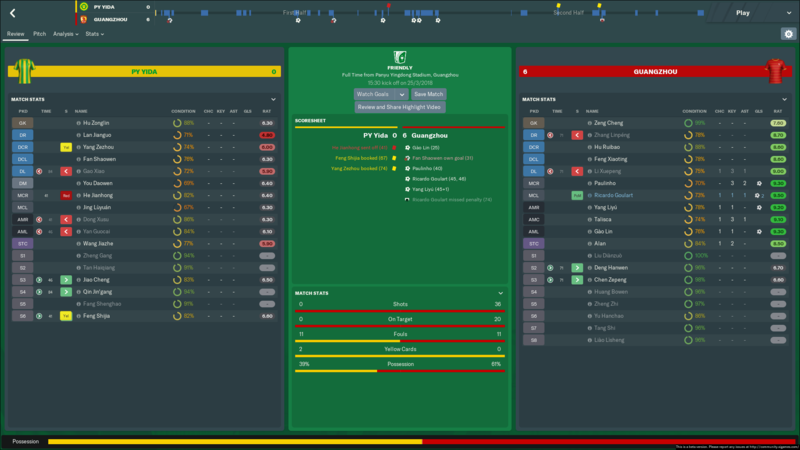 The quadruple is still on! Unbeaten in May I would say the next 2 league games you should win comfortably really mate. Really hope you pull off getting all 4 trophies, however I'd be concentrating on the league if it was me. All the best though, I always see Saudi teams always do well in the Champions league. Here's hoping! 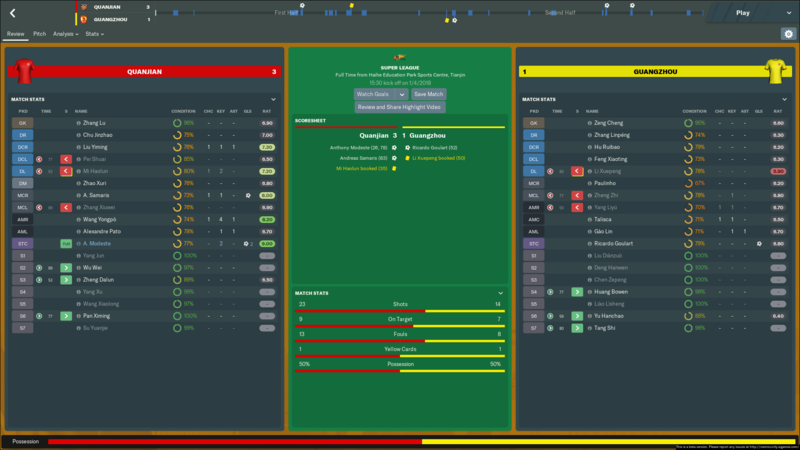 The quadruple comment was a bit tongue-in-cheek, it's not impossible of course but I'd never expect it - especially, as you say, with the tricky competitors in the AFC CL. June brings with it very few fixtures, only two competitive fixtures took place; though we did have two friendlies too. 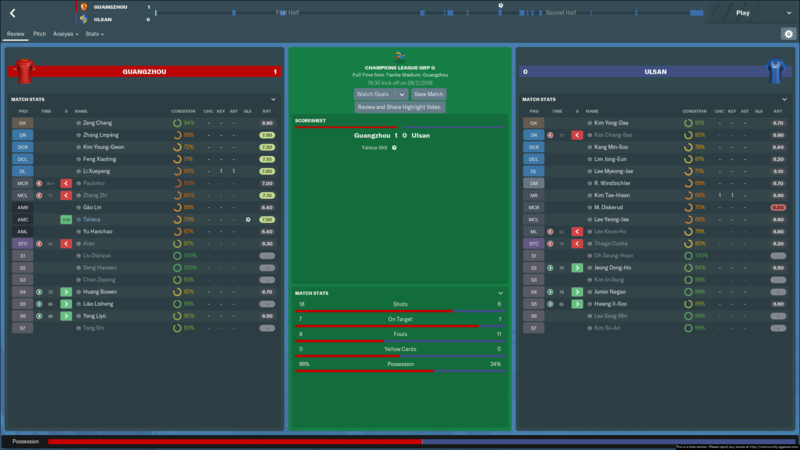 It was more notable for its off-field antics, the transfer window opens (with some issues) and we find out our AFC Champions League quarter-final and potential semi-final opponents. Consecutive away games in the Chinese Super League, Beijing Renhe got the better of us by a single goal. We reacted by the doing similar to Tianjin Quanjian a week later, Gào Lin netting our winning goal. 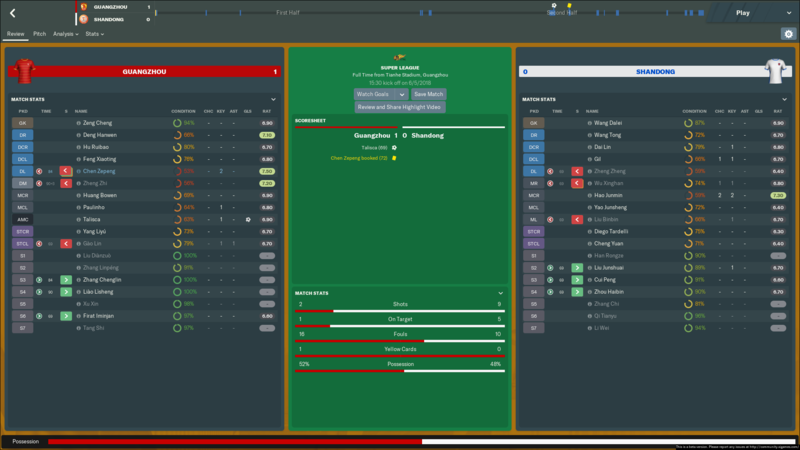 The two friendly games were won very comfortably, I had scheduled a few more but squad fitness is quite low at the moment so decided a rest period would do them better. The aforementioned CSL results put us fourth in the table, Shanghai SIPG are now nine points clear so a gigantic turnaround is needed if we want that trophy - unlikely. As I mentioned, off the field stuff dominated my thoughts for June. 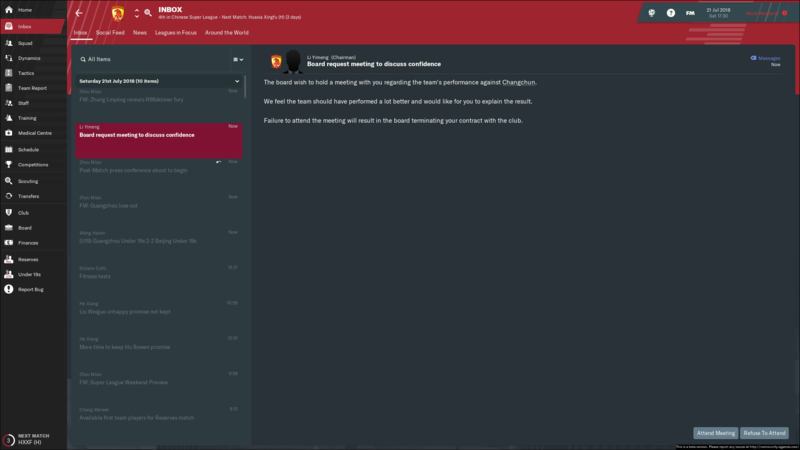 The transfer window opened, which got me excited for precisely five seconds. 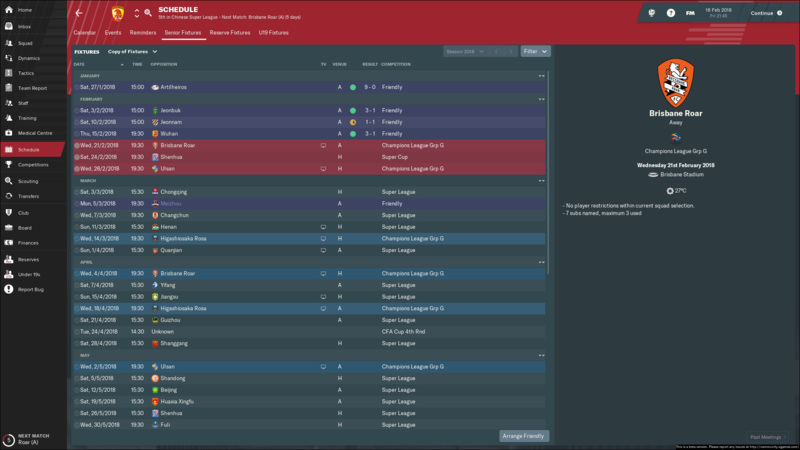 I had/have all my dealings done already, signing two much needed centre-backs as well as a back-up striker. However, those deals have/will be cancelled due to the league's transfer rules. It's pretty confusing, but in short: you can only sign eight over-17 players and five over-21 players per season (thirteen total). 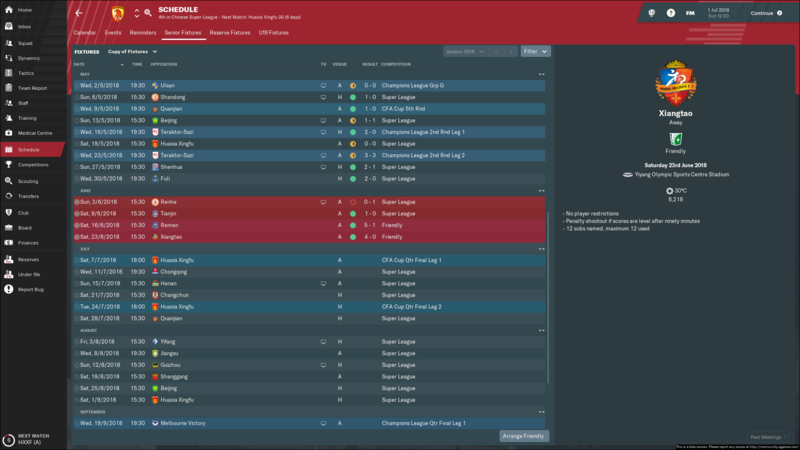 According to the game, we've already exceeded those regulations despite not signing even one player this season. 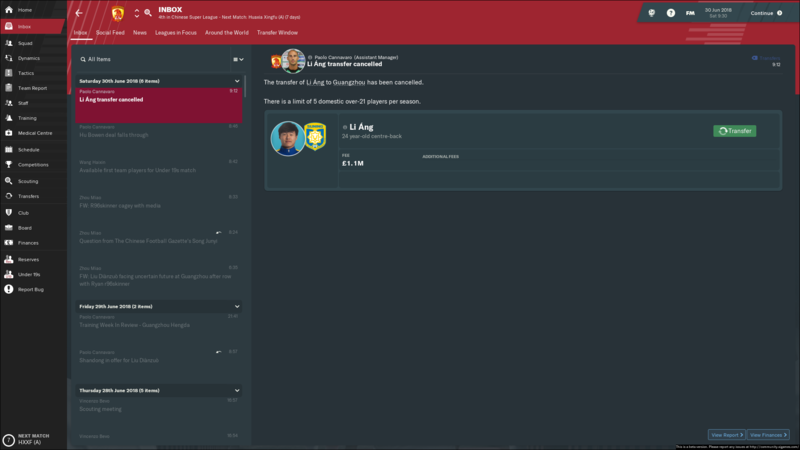 I don't think it's a bug, I think the game is taking into account Guangzhou's real life signings so I guess IRL they signed the limit of players. With that said, on the over-17 rule it says: max 8 (currently 11) - which makes zero sense. Frustrating. On a happier note, our Champions League quarter-final opponents were drawn: Melbourne Victory await! 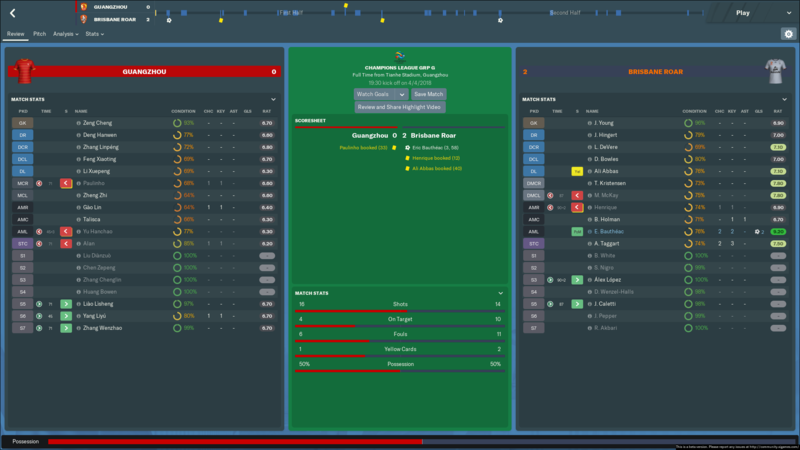 We return to Australia, having faced Brisbane Roar in the group stages. If we beat the A-League club, we'll face the winner of Urawa Red Diamonds (JPN) and Persepolis (IRN). I'm not saying that's easy, but I am very pleased with that draw. We've avoided the three strong Saudi Arabian teams as well as Esteghlal of Iran. 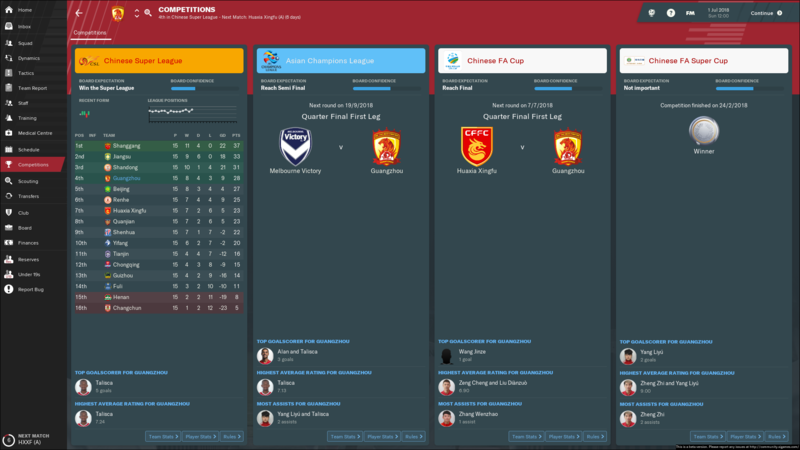 We have a full two months of CSL action until the Melbourne Victory first leg, so depending on how our domestic situation is looking I may go full out for the AFC Champions League. We'll see. 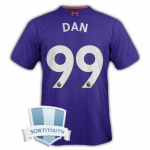 I want to win, at least, the CFA Cup. B: Here's the transfer issue via a screenshot. July 2018 is here. It promised to be a big month with some good looking Chinese Super League fixtures on paper, along with the crucial CFA Cup quarter-finals. 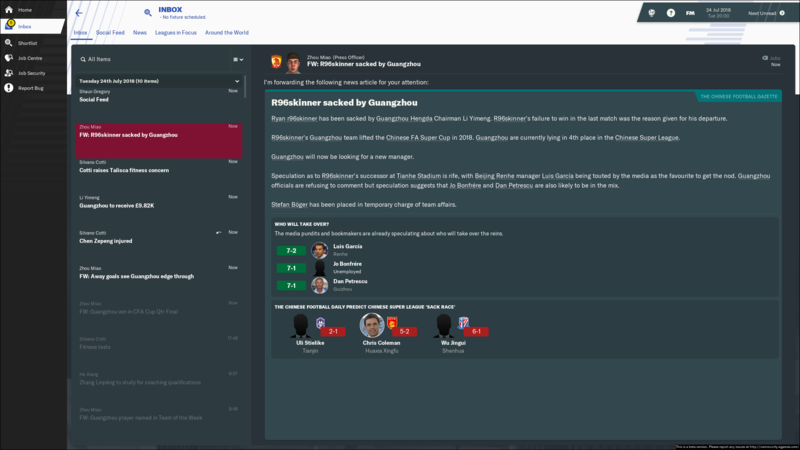 I've been sacked by Guangzhou Evergrande, in pretty amusing circumstances. As you can see from the previous results, form has not been the best. After the Henan Jianye and Changchun Yatai (the bottom two!) results which, admittedly, were disgraceful, the board called a meeting. However, it was only called due to the Yatai defeat. By the meeting's conclusion, they wanted a "positive result" in our following fixture - the CFA Cup quarter-final second leg against Hebei China Fortune. 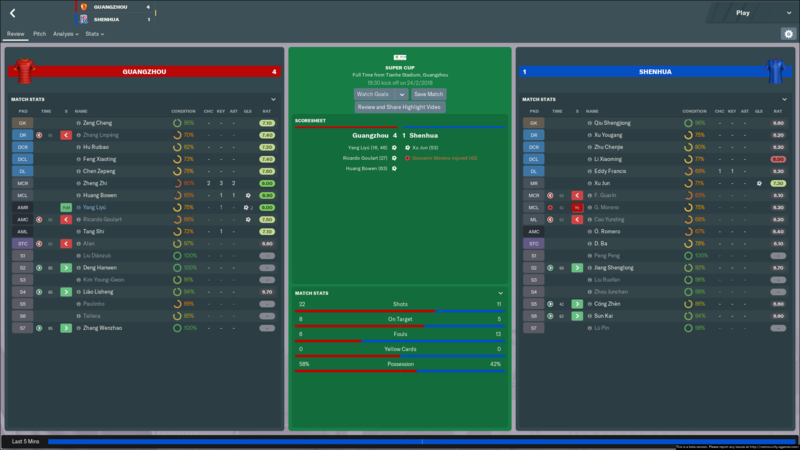 Days later, we faced Hebei and secured a goalless draw which sent us through on away goals after the 1-1 first leg. That, apparently, isn't a "positive result". Sacked I was. Extremely frustrating, but at least it was a fun way to go out. Bug? I'm not sure, I hope so! 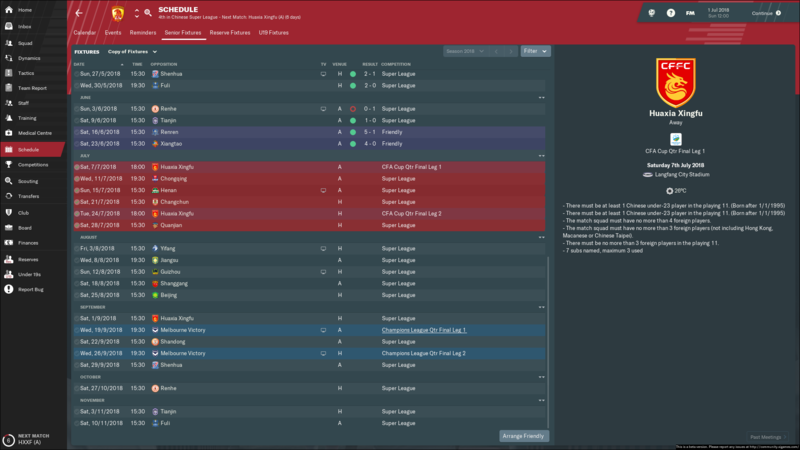 This brings the save and subsequent career post on here to a premature end, I'll be beginning a new 'Trip to' soon - I'm thinking South Africa, but I haven't decided just yet. Thanks for reading this career, apologies it has ended so soon. 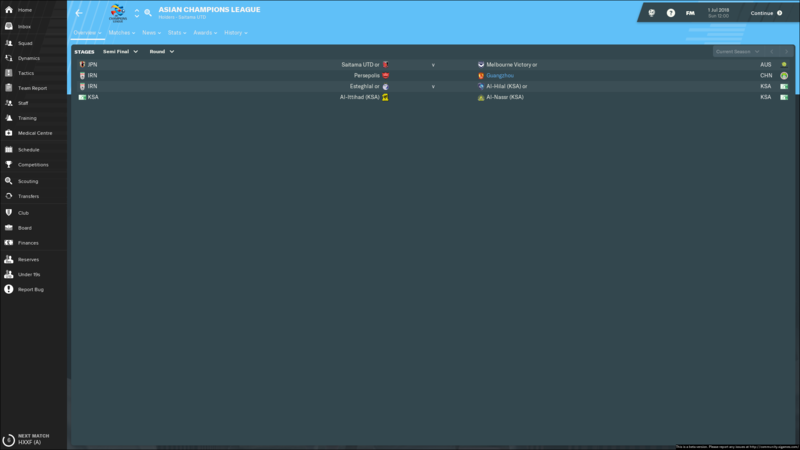 I was excited for the AFC Champions League quarter-finals but hey-ho. 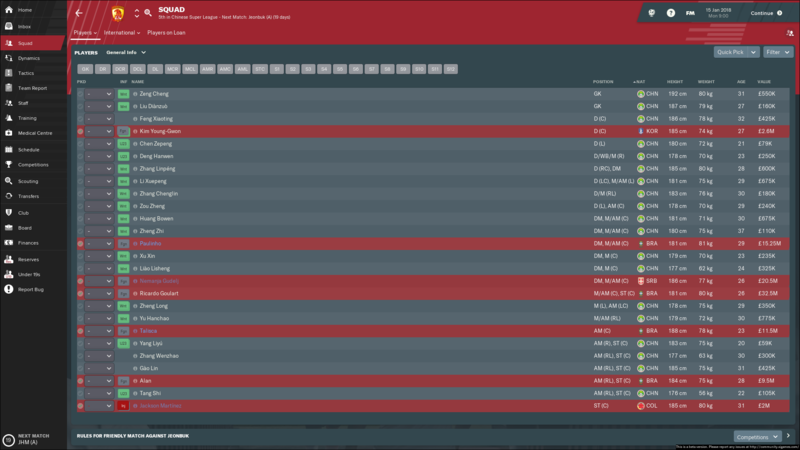 Well, at least I wasn't the first person on Susie to be sacked on this years FM. But, one poor month and you're out of work and that's perhaps an extremely harsh sacking @r96Skinner but I'm sure you'll be able to find another job soon. Wow, surely that's got to be a bug? 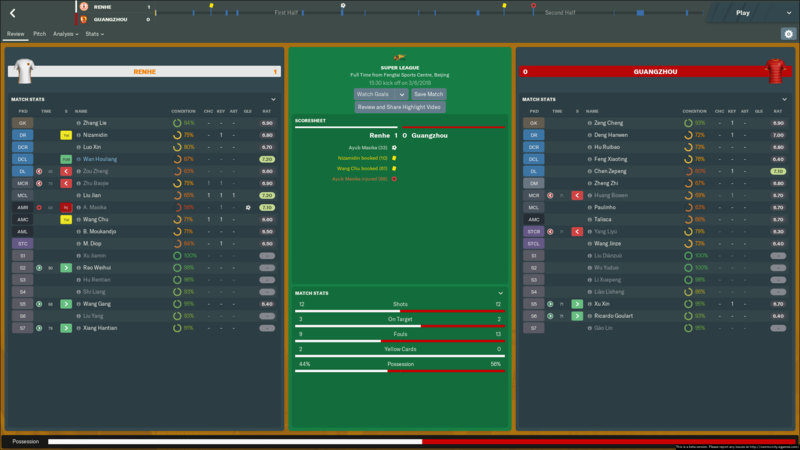 Don't think I've ever seen someone get sacked after winning a game before (even if it was on penalties). Would be fun to see you take over another club in the Chinese Super League to exact some much deserved revenge over that Guangzhou board! WHOA. That escalated quickly bro! Absolutely shocking turn of events, no way you deserved that. 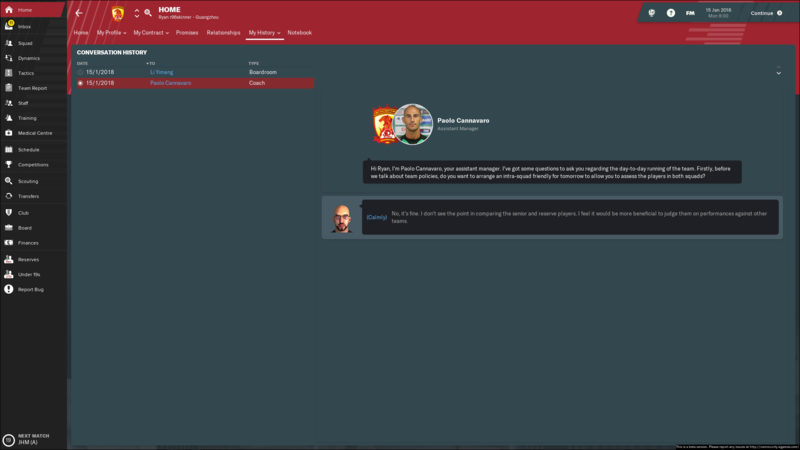 What's next then, are you giving up on this save or are you going for another job?